Completamente locos, muy hambrientos, 'Los Gourmets' son una familia aterradora y malvada. Víctimas de la crisis que afecta su área, y bajo la dirección de Gertre, el patriarca, están listos para hacer cualquier cosa por comida, incluso lo peor. Completely mad, very hungry, 'The Foodies' make a terrifying and evil family. Victims of the crisis affecting their area, and under the direction of Gertre, the patriarch, they are ready to do anything for food, including the worst. Guionista y director francés. En 2011 escribe y dirige su primer cortometraje 'Throttled at Birth', una fusión de acción real y animación en plastilina. También ha realizado 'Death Sentence' en 2015 y 'The Foodies' en 2017. Finalizará su primer largometraje 'Super Z' a finales de 2018. French screenwriter and director. 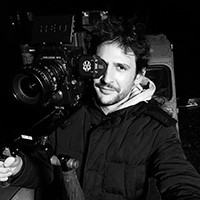 In 2011 he writes and directs his first short film 'Throttled at Birth', a fusion between live-action filming and plasticine animation. Two short films will follow, 'Death Sentence' in 2015 and 'The Foodies' in 2017. His first feature film 'Super Z' will be finished late 2018.